As I drove down Route 50 this morning from Paris to Middleburg, Virginia, it was so tempting to pull over for all for all the beautiful photo ops along the way. The sun was rising over misty fields, some still tinged with snow. The trees were in full color, and with a hard frost on the grass the colors just popped. Thankfully, I was with camera today. So after dropping Cam off at school, I parked the Tahoe and took Peppermint and my trusty 100 mm lens out on a walk around The Hill School grounds. A path winds through the 137-acre campus, past the soccer and baseball fields, the Dornin Science Center and back around through the hay fields. Peppermint was in heaven, running and leaping through the tall grass, following intriguing scents and collecting burrs. I shot macro as well as landscape, finding great textures and backlighting. We saw deer, turkeys, hawks and heard the distant voice of the Middleburg Hunt hounds as they worked a nearby field. It was the perfect way to start a gorgeous autumn day. The only drawback was that I had to endure cold and wet feet the rest of the day. A ball left behind that is out of prospective? 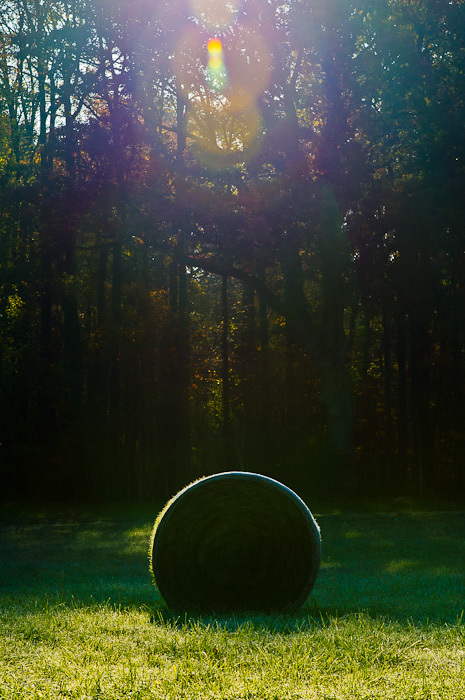 A bale of hay? A round table turned on the side? But it has texture around the sides. I have spent more time contemplating this than all of the other beautiful pictures. Help me!!!! I round bale of hay, sitting a frost-covered field with the sun coming up behind it. 🙂 But, as with any photograph, it’s always up to the interpretation of the viewer to take it beyond reality if she wishes! NIce light…and the things we do for our pups wet feet and all!! Thank you! Yes, our dogs do rule, don’t they?